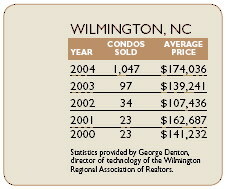 FROM WEST PALM BEACH, FLA., TO WILMINGTON, N.C., condominiums are the talk of the real estate world. Whether it-s new projects selling out even before they-re built, conversions of apartment complexes to townhomes, or the transformation of high-rise hotels into "condo-hotels," condominiums are hot property. While that-s also true nationally, especially in markets such as Las Vegas, the buying trend is nothing short of sizzling along the Southeastern shoreline. Buyers nationwide are flocking to condos as a cheaper alternative to single-family homes, and the lifestyle choices offered in the coastal areas of the Carolinas, Georgia and Florida are now playing a greater role in buying decisions, experts say. Low interest rates have also played a major part in attracting second-home buyers. In fact, a recent survey conducted by Centex Destination Properties of Altamonte Springs, Fla,. identified areas of Florida and coastal South Carolina as being among the most popular destinations in the country for second-home buyers. Take the Myrtle Beach, S.C., area as just one hot example. 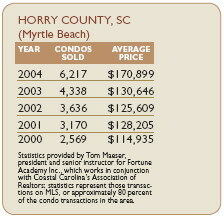 According to a May 26, 2005 article in the Myrtle Beach Sun News, sales of new condos in Horry County surged a whopping 400 percent in the first quarter of 2005 over the same period in 2004, with building permits for new units soaring from 110 to 1,009. According to the story, market analysts attribute the phenomenal growth to "demand from affluent buyers who have fled the stock market, and they believe condo construction will slow only if the supply of vacant land or aging hotels ripe for conversion dwindles." Nationally, condo sales have grown from 8.8 percent of the total amount of real estate sold in 1994 to over 12 percent in 2004, according to the National Association of Realtors. The NAR also notes that the total sales of existing condos have been on a steady upward swing, growing 9.7 percent in 2002, 11.3 percent in 2003, and 12.2 percent in 2004. Home sales in those years rose 5.1 percent, 9.6 percent and 9.4 percent, respectively. 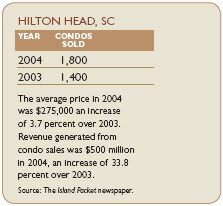 The average price increase in condo sales has also outpaced home sales in the same time frame. 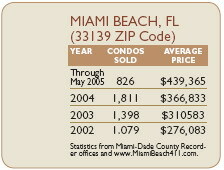 From 2001 to 2002, condo prices rose 16.5 percent, while home prices increased only 8.8 percent. The condo/home price increase ratio from 2002 to 2003 was 13.7 percent, compared to 7.2 percent for homes; and from 2003 to 2004, 16.4 percent vs. 9.3 percent. According to a Realtor Magazine Online article dated February 28, 2005, "Condos are particularly popular among single women, as well as empty nesters looking for maintenance-free lifestyles. Additionally, many owners of single-family homes are trading up into luxury condos that are jam-packed with amenities." Al Mansell, the president of the National Association of Realtors, states in an article at the NAR website that condos- reputation as an investment has changed dramatically in the past decade or two. "In much of the 1980s and early -90s, condos earned a reputation for slow price growth, in many cases because there was an oversupply on the market. With the maturation of this market segment, condos have been appreciating faster than single-family homes for the last four years. In the past, affordability was a bigger factor in condo sales. Now, lifestyle choices have emerged as a driving force in their growing popularity." Those lifestyle choices and the many attractions of living on the South Atlantic coast — moderate weather, beautiful beaches, top-ranked golf courses, and the ability to enjoy outdoor activities virtually year-round — are helping draw condo buyers to the region. Buyers who enjoy an active lifestyle are seeking amenity packages that include golf, tennis, swimming, access to water sports, hiking and biking trails, and equestrian facilities. 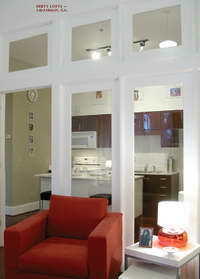 Just as diverse as the lifestyle choices are the condo styles available throughout the region. Here are just a few options you-ll find in some popular condo communities. Bannerman Station is a distinctive mixed-use project now under construction just two blocks east of the Cape Fear River and one block east of the Cotton Exchange in the heart of historic downtown Wilmington. According to Realtor Todd Toconis, owner of Town & Country Real Estate in Wilmington, Bannerman Stations offers 38 private residences on five floors above the retail and parking area. A secured private lobby provides access to the upper stories. Bannerman Station-s floor plans provide one-, twoand three-bedroom layouts ranging in size from over 1,300 square feet, to over 2,000 square feet on the penthouse level. All residences will have balconies or terraces providing views of the Cape Fear River or the cityscape. All plans have standard features, including two full-tile baths, gourmet kitchens, pantries, laundry facilities and walk-in closets. 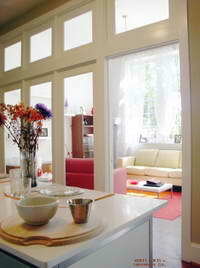 Some plans have additional features such as window seats, wine racks, art niches, bookcases, or computer nooks. The standard ceiling heights are nine feet and greater on the penthouse level. Hardwood flooring, crown molding and ceramic tile are also some of the other interior standard features at Bannerman Station. The residential pricing is expected to range from $390,000-$800,000. This includes a deeded on-site parking space and exterior storage space adjacent to the elevator. For more information on Bannerman Station, call Todd Toconis at (910) 763-7500. The flagship Central Tower at Bay Watch Resort & Conference Center opened in June 2003. According to Tim Thomas, a sales associate for CondoLux, the tower completes the resort-s three phases and brings to life these spectacular oceanfront condominiums with commercial facilities and amenities unparalleled in the North Myrtle Beach market. Located on beautiful Ocean Boulevard, the resort offers a variety of amenities, including two oceanfront restaurants, two indoor pools, three outdoor pools, indoor and outdoor kiddie pools, a fitness center, game room, sports bar, outdoor tiki bars and even a small convenience store. Bay Watch has one oceanfront restaurant — The Blue Room Café — an oceanfront lounge, the Sandtrap Cocktail Lounge & Sports Bar, and a brand new beach bar, Fishtails Beach Bar. Bay Watch-s three phases offer one of the most diversified portfolios of floor plans available on the Grand Strand. One-, two- and three-bedroom condos are available, with the one-bedroom units starting in the low $300,000s. For more information on Bay Watch Resort, call Tim Thomas as (843) 272-2073. Every day is a school day at this innovative condominium project in historic Savannah - but that-s what makes it one of the most interesting developments on the Southeastern coast. The 17 Herty Lofts are one- and two-bedroom condos housed in a former school - and lest you forget that-s what the building used to be, the designers left the white porcelain water fountains on the walls of the wide hallways just to remind you. Inman Park Properties of Atlanta and Savannah teamed up with Cora Bett Thomas Realty Co.-s Condo Gallery to give a fresh start to the school, which closed in 1992 after more than 50 years as an educational institution. These are consciously hip, luxury condos with modern design touches such as glass walls in the living rooms to help light stream in, oversized windows, decorative moldings and sophisticated wiring for high-speed Internet connections. A story in the Feb. 19, 2004 Savannah Morning News stated, "Herty Lofts offer the perfect lifestyle option for young professionals, empty nesters or anyone looking for a unique living space that combines Savannah history with the best of contemporary living." One-bedroom, one-bath units start at $174,900, with twobedroom, two-bath units starting at $219,000. The Herty Lofts offer 12-foot ceilings, new hardwood flooring, Silestone countertops, gated parking and keycard building entry. Phase II of the project is currently being planned. For more information on Herty Lofts, go to www.HertyLofts.com or contact Cora Bett Thomas Realty Company, 24 East Oglethorpe Ave., Savannah, Ga., 31401, telephone (912) 233-6000. Agents handling the project are Peter Nelsen, (912) 713-3343; Addison Dodd, (912) 658-0646 and Ruthie Seese, (912) 272-1690. "Location With Attitude" is the buzz phrase for Metropolitan at CityPlace in downtown West Palm Beach. Scheduled for completion in late 2005 or early 2006, this elegant, modern condominium complex is being developed by Metropolitan Development Group LLC, an affiliate of Kenco Communities. Kenco, in the past decade, has developed more than $1 billion worth of real estate ventures in South Florida, including such high-profile projects as Addison Reserve, Grand Palm at Ballen Isles Country Club, Wycliffe Golf and Country Club, The Oaks at Boca Raton, Stone Creek Ranch, Mirabella at Mirasol, and The Country Club at Mirasol-s villages of Florenza, Mariposa and Talavera. Metropolitan offers 149 luxury units — studios, one, two or three bedrooms — in a private, eight-story building at Sapodilla Avenue and Fern Street. The condos are centrally located for owners to enjoy the multiple attractions of CityPlace, West Palm Beach-s bustling, upscale entertainment venue, which features ritzy shopping, a number of high-caliber restaurants, a 20-screen movie theater complex and the Kravis Center for the Performing Arts. Condos at Metropolitan offer a 24-hour staff, rooftop pool and spa, a sky terrace, a fully equipped fi tness center, a professional business center and media room. Individual units feature contemporary designs with lavish tile fl ooring, fi nish molding, spacious walk-in closets, and gourmet kitchens that include Europeanstyle cabinetry, granite countertops and stainless steel appliances. Prices start in the $500,000s. For more information on Metropolitan, go to the website www.GoMetWPB.com.